I've created some original graphics on the theme of Books, and you are welcome to use them if you wish. 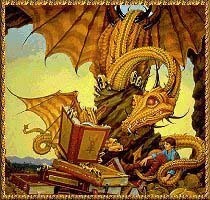 If you would link back to http://www.anitra.net/books/ in exchange, I'd be tickled pink. And when you do, I'll post a link to you. To download images, wait until everything has fully loaded, including the animation. (You'll see the "Reload" button become active.) For Macs, click and hold on images to get your download menu; for IBMs, right-click. For the bordered backgrounds, be sure to download from the box that says "Download This One." to take us lands away." and a more complex one. This seems to always go with books. This is what I got playing around with Arts&Letters on the IBM PC.